Just an impression is a new show at the Green Drake! 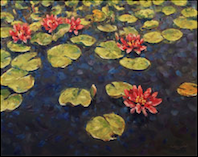 A new collection of large impressionistic oils by Resident Artist Karl Eric Leitzel will be shown for the first time. Artist's reception Friday evening, April 6th.